Railway Health ATM Machine List Under project of Health ATM Machine Railway wants to make Rs 1200 Crore money per year that will also generate employment to new youth, doctor, nurse or consultant present in Railway Health Machine. 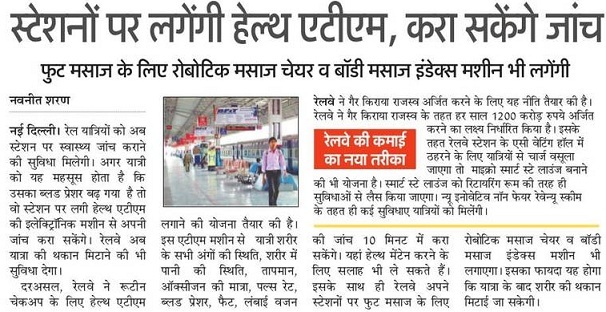 Railway said will make Micro Smart Stay Lounge for premium customer who books Mostly AC, 2nd Class ticket, however the Health ATM Machine is also open to public but they have to pay charge on it. Under New Innovative Non Fair Revenue Scheme all Train yatri are eligible to take benefit. 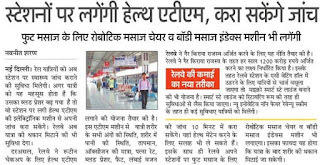 Railway Health Scheme:- Railway for routine checkup has said make Station as Health ATM Platform. This Health ATM machine will check all types of body maintenance, availability of water in Body, Body Temperature, Level of Oxygen in Body, Pulse Rate, Blood Pressure, FAT, Height, Weight check up within 10 Minutes. After Long Journey you can relax with Railway Health Center. 1. Health ATM will be a single integrated machine designed to diagnose all the chronic disease diagnosis to all the basic medical problems. 2. It will do the same work for a Hospital as an ATM machine do for a Bank.